This article is part of a special series of web articles to celebrate the launch of Issue 29 of Next American City, which is entirely devoted to two “Comeback Cities”: New Orleans and Detroit. This week we will feature magazine content from that issue, as well as feature stories from the New Orleans Lens, a NOLA-based news site featuring investigative reports and breaking news from the Crescent City. To subscribe to Next American City and receive Issue 29, click here. The line between graffiti and art and public space and private property can be thin, especially in a city struggling to manage a high unemployment rate and absentee property owners. But after 20 years, Detroiters are realizing what can happen when a city colors outside of the lines. Many efforts are being made to change Detroit’s image and create a secure foundation for its future. The business and foundation community are funding incubators; educators are prepping young adults for 21st-century jobs; the public and private sectors are working to bring new industry to the city—and artists are painting. Detroit’s two major public art efforts — the Heidelberg Project and Public Art Workz (PAWZ) — are not only beautifying the city, but also enhancing neighborhoods, bringing hope to residents, engaging the residents, fostering diversity, educating children and drawing positive national and international attention to Detroit. 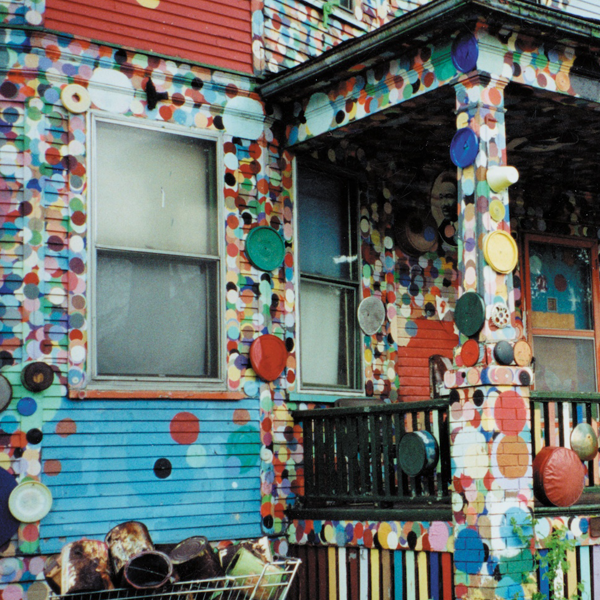 The Heidelberg Project, which is on Heidelberg Street on Detroit’s eastside, was started by Detroit native Tyree Guyton in 1986. (At left is the project’s famous “Party Animal House.”) Guyton’s goal to clean up the street started with sweeping, picking up trash and clearing the sidewalk. Working with his wife and father, Guyton added a paintbrush and some neighborhood kids to the mix. Eventually, they started painting abandoned houses, using their brushes as artists, not painters. Now Heidelberg Street is a color wheel explosion. The houses are large-scale mosaics, the streets and sidewalks look like something from a children’s board game and the statues and installations are as much a part of the neighborhood as the people. Even the trees have pizazz. But it wasn’t always that way. Initially, many of the residents opposed the project, suggesting it might bring down housing values. They also had an unfavorable association with the project, viewing it as graffiti rather than art. In 1991 and in 1999, the City of Detroit demolished a portion of a Heidelberg installation and in 2006 and 2007, the same three structures were lit on fire. Heidelberg dissenters still exist, though their numbers are not quite as vast. Structures are occasionally vandalized, but Heidelberg Project participants continue to be patient and engage with the community. Whitfield says the project has boosted housing values and is slowly bringing in new out-of-state residents. After seeing the project, a Wisconsin couple recently contacted Whitfield about moving to Heidelberg Street. “Art has been the catalyst that brought people together to create dialog,” she said. The Heidelberg Project is a tourist destination, and in 1991 Guyton appeared on the Oprah Winfrey Show to discuss the city’s demolition order; in 2004, the project received the Environmental Research and Design Award for Place Design; and in 2005, the project received the Silver Medal Rudy Bruner Award for Urban Excellence. Heidelberg installations and Guyton have traveled to communities all around the U.S. and Europe, sharing the vision and its execution with other people interested in using public art to enhance cities. The city’s other major public art project, PAWZ was also founded by a Detroit native, one Charles “Chazz” Miller, a commercial artist who started PAWZ in 2003 to improve the community not only through art, but also through education. One of the most well known PAWZ project is the “Papillion Effect,” a collection of painted plywood butterflies strategically placed in neighborhoods all over the city. Miller hopes to complete 1,000 butterflies by the end of the summer. Why butterflies? Because they’re uplifting and have encouraged some individuals who had resisted the project, to readjust their thinking. Miller’s also working on “Mood Swings,” a mass undertaking to renovate dilapidated park swings with design, paint and volunteer work. The swings become a source of community pride in otherwise neglected community parks and represent what Miller sees as a shifting “mood” in Detroit. PAWZ has several art programs that reach more than 1,000 kids a year. The Artist Village, also a Miller creation, is a physical space that gives kids a platform to express all art forms including poetry, hip-hop and fashion. One of Miller’s students, who organized a fashion show at PAWZ for his designs that attracted more than 300 people, is now studying at the Fashion Institute of Technology in Chicago. The city recently commissioned PAWZ to create a large installation in the Brightmoor neighborhood. In keeping with his commitment to education, Miller chose seven kids to help him with the project. The “Creative Class of 2010” should be rolling out the first phase of the project in 2010 and the second in the spring of 2011. The paradigm shift created by the Heidelberg Project and PAWZ is a testament to the positive impact the projects have had on the city. Within the next couple of years, the Heidelberg Project will open the “House that Makes Sense Center,” an in door space designed to protect installations from the elements and house additional pieces of art. Miller is working on expanding the Artist Village and is hopeful that PAWZ murals will soon land on some of the city’s abandoned skyscrapers. Miller is getting some resistance on the skyscraper idea and continues to receive kickback from absentee landlords who have reprimanded him for not getting permission to work on their buildings. But innovation and change are not easy and resistance is part of the process.